Pearl River Poem Art Festival: including Eddie Tay, Kit Kellen, Duo Duo, Zheng Danyi, Martin Alexander, Wang Xiaoni, Shu Ting. IT WAS A TIME of deep disaffection and despair. Those who had experienced the agony of the Cultural Revolution were filled with uncertainty about the future of China. Her people had hungry souls as well as stomachs and poetry helped to feed them, becoming an inspiration and a source of hope in a profoundly depleted nation. “Money worship” – as Chinese call the current obsession – had yet to become the god it is today. When Mao Zedong died in 1976 and the grip of Maoism loosened, the country began to breathe again. Modern Chinese poetry found its voice, first through the politically subversive Misty poets, then with the literary innovations of the New Generation. 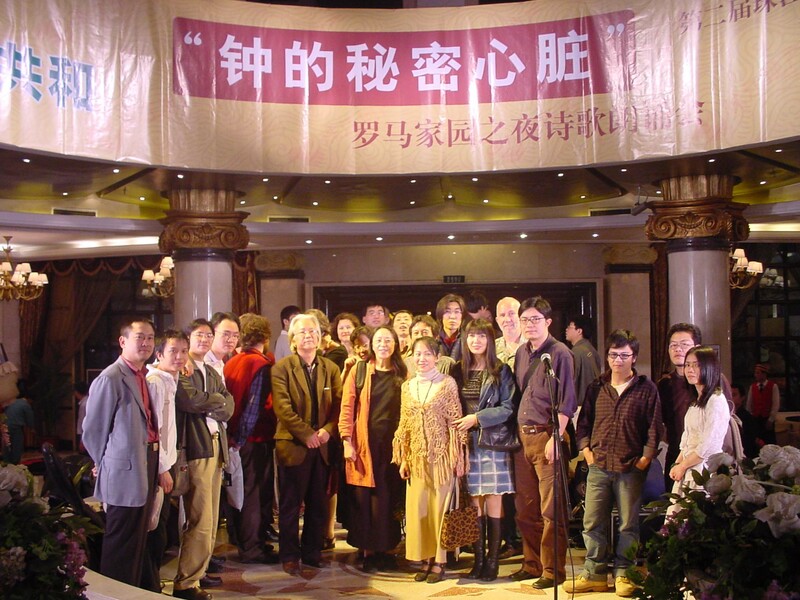 As the Yangtze and Yellow rivers carve out the geography of China, so have the two schools shaped the landscape of contemporary poetry – Misty poets coming largely from northern China, near Beijing and the New Generation being mostly southerners, from cities along the Yangtze between my home province of Sichuan and Shanghai. Although both groups were united in fierce opposition to Maoist repression, they disagreed fundamentally about poetry itself. Misty poets, characterised by necessary ambiguity and a refusal to praise the regime, emerged from a literary vacuum to confront urgent political and social issues. Their name, which had originated from a scathing insult by an outraged party critic, had developed into a badge of pride by the 1980s. Equally passionate, but literary and introspective, the New Generation later forged a link to reconnect with China’s long poetic tradition and make it anew. Born in 1948 to a privileged Party family, Shi Zhi was an unremarkable writer during his adolescence – but the terrors of the Cultural Revolution transformed his poetry into something truly powerful. Images like the one in the poem above infuriated Mao’s wife, Jiang Qing, and in 1968 Shi was questioned by police. Internal exile and a debilitating paranoia followed. Though his background protected him from beatings, he was nevertheless a broken man by 1973. He no longer writes. Misty poets asserted the value and dignity of the individual against Maoism’s attempts to erase private life altogether. Though their only language was Mandarin (and their tone the strident idiom of the Cultural Revolution), they turned it to emphasise compassion and a shared humanity. Jintian, Beijing’s hugely influential literary magazine, was instrumental in bringing their movement into the open. With the growing freedom of the late 1970s and mid-1980s, the publication highlighted key poets such as Bei Dao, Duo Duo, Shu Ting and Yang Lian, whose work, (with the addition of Liu Xiaobo’s You Wait for Me with Dust) is featured in the following pages. Misty poets were brave enough to articulate the zeitgeist with a powerful and often angry voice. Though the literary value ascribed to their work has perhaps been inflated in the West by its political context and in China by its novelty, its audacity had a significant and liberating impact in China. Minor poets (and the lesser work of significant poets from both schools) are now represented in Chinese university textbooks. This tactic of emasculation has dismissed modern poetry to the fringes of the dominant communist canon. A good example is Liang Xiaobin’s famous but mild China, I Lost My Keys, which even he has declared “dishonest” and “not a modern classic”. In the turmoil following Mao’s death, literature had served as a tool for confrontation; but by 1985 this opposition had exhausted the Misty poets. As Deng Xiaoping lifted the weight of repression, at least for the moment, it seemed their job was done. It was time for a rising generation to take the stage. Over and over again, this was my silent vow. We were ravenous for books, for music and for ideas. One of Zhang Zao’s professors appealed to colleagues in the United States for a shipment of books, saying, “They’re hungry for anything in print!” We read anything we could. If you read, you will think; if you think, you will talk; and then you will think about how to write. This is where New Generation poetry came from. For us, poetry wasn’t just a social tool or a political weapon. We worked to create an independent literary movement, inspired by T.S. Eliot and other Modernists, and to form a new sense of beauty from Chinese and Western traditions. We wrote in the music of our own southern languages – and edited with an ear for Mandarin. A vernacular approach was therefore also important – what Coleridge called “the language of ordinary men”. This had been a feature of China’s New Culture Movement, which flourished from 1917 to 1919. It aimed, as we did, to build on the literary traditions of the past and to speak directly to a broad audience in its own language. Tragically, a few extremists in the movement overturned their founding principles by declaring war on China’s literary heritage. Chief among these was Chen Duxiu, who later became the first chairman of the Communist Party and was one of the models for the destructive fanaticism that characterised the Red Guards in the 1960s. Laying the ills of the present at the feet of the past, they insisted that all our traditions were corrupt and must be swept away. We determined to restore this creative innovation to its place in the continuum of classical tradition. What separated us further from the public, representative voice of the Misty poets was our desire to open the private space of the individual to poetic expression. I speak only for myself – I am nobody’s spokesman. I am Zheng Danyi and I am Chinese. In the two or three intense and productive years before Tiananmen, the major New Generation poets included Zhang Zao and Cheng Dongdong, whose poetry is also featured herewith, as well as Hai Zi, Xi Chuan, Hu Dong and Zang Di, among others. By 1989 the 60s generation was ready to build a new China. Some of us had become leaders of the democracy movement; for others, the passion was literature. But the Tiananmen Square massacre changed everything. Some activists were killed or simply disappeared. Many were imprisoned, some escaped into exile. Others moved into different professions and abandoned writing. As for the fate of the Misty poets after Tiananmen, Shu Ting, the only southerner prominent in the group, never left China: she is still widely admired for her patriotic and political poems of the late 70s. In contrast to these, presented here is an intimate, more southern poem, whose speaker remembers her first lover. From among the northerners, Duo Duo flew from Beijing to Hong Kong on the day of the massacre and has recently returned to the mainland after a long exile, mostly in Amsterdam. Bei Dao was in Europe on that June 4. He re-established Jintian in Sweden and now teaches at the Chinese University of Hong Kong. Jintian is today a general cultural magazine that avoids controversy. The Misty poets no longer represent the voice of dissent. The New Generation and other groups that burned brightly in the late 1980s have become wisps of smoke in the furnace of China’s economic development. We don’t know if this materialistic heat will spark a revival of China’s long passion for poetry, but whatever happens those of us who have lived through the social upheaval and political chaos of the last three decades will still be writing. With Martin Alexander and Shirley Lee. Unless otherwise credited, poetry translations are by Zheng, Lee and Alexander. Special thanks to Luo Hui.